Taking five days off …. Taking five days off to visit family (enjoyable as it was) does have its problems, especially when I have an exhibition to work towards ….and only just over five weeks to get everything ready. This time last week I was thinking that everything would be fine and nothing to worry about. Now, after getting back from Shropshire yesterday evening, I’m starting to panic a bit!! I’ve been lying awake this morning trying to work out how many paintings I still need to do …..and what they’ll be! On top of the actual work (the paintings and drawings), there’s all the ‘paperwork’ to be done, (creating cards and prints, sending out invitation cards and emails and writing and sending out press releases). So then, there’s much to do and this is going to be rather a short affair this week. As I say, we had a very pleasant time in Shropshire and although there is no real art or no big walks to report, we did manage two very pleasant short walks in the Shropshire countryside. For anyone who hasn’t visited this county, well, I would certainly recommend it. The countryside is a beautiful mixture of farmland and low hills, lots of trees and pretty villages and towns. Nita’s folks live a few miles from the famous Ironbridge Gorge with all its famous industrial history and heritage. 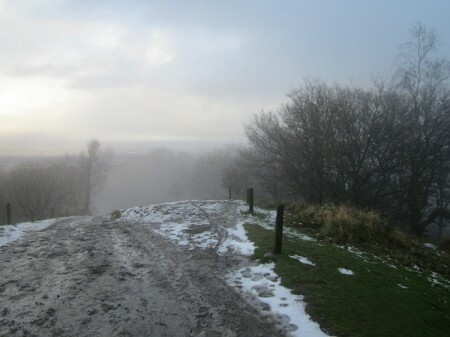 Ever since my parents moved from Essex to Welshpool, (on the boarder with Shropshire) back in 1969, I’ve wanted to walk the prominent little hill called the Wrekin. It sits on the edge of Telford and we could easily see it from the top of our local hill The Rhallt …even though it lies about 30 miles to the east. Daft as it sounds, its taken me 43 years to finally walk to the top of it. We went there on Monday afternoon and wandered up the path through woodland to its snowy top. I had always imagined that there must be great views from the top but of course on this cold January afternoon everything was shrouded in cloud. 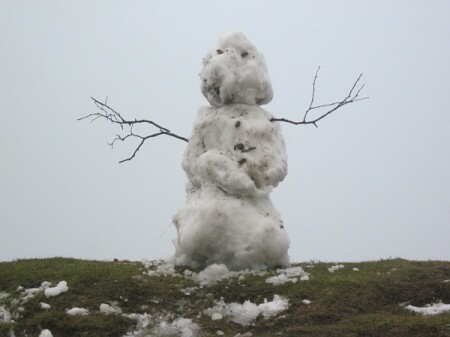 We did see a bit of ‘art’ …a rather fine snowman that someone had built! Within a few minutes of leaving the top and heading back down, we were engulfed by a heavy hail and snow shower and we were all looking rather like the chap on the summit! 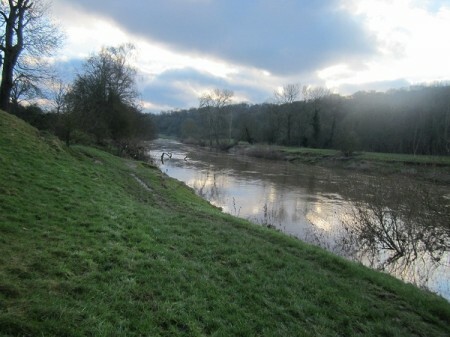 Our other walk, a gentler wander the following day, took us along the banks of a rather swollen River Severn near Hampton Load. It’s a very rural setting and at the place where you park there is a fine pub serving excellent food and beer …which we just had to sample before going for our walk by the river! I think the place was called The Rod and Railway. Highly recommended! We’re now back in Irvine and I’m already working on the painting again. We got out of England on the right day ….much snow fell yesterday apparently …but not up here in sunny Ayrshire! We’re heading up to Rannoch Moor on Tuesday with a bit of luck …so a full report at the end of the week.